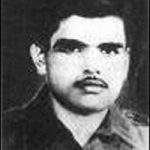 Major Mahander Singh Chaudhary was born on 7th May, 1930 in village Dudaldhan Majra, about 40 km from Rohtak, in Jhajjar district of Haryana. His father Chaudhary Partap Singh was a PCS officer in the joint Punjab and his mother Smt Sahib Kaur, a home maker. He lost his father at the age of seven and was brought up by his maternal uncle Major Ameer Singh, a former minister of Haryana. After completing his education from Punjab University, Major Chaudhary joined the Army in the year 1956 and was commissioned into 9 Punjab of the famed Punjab Regiment, a regiment known for its fearless soldiers and numerous battle honours. By 1962, he had served for nearly six years with hid unit in different field locations and was promoted to the rank of Major. 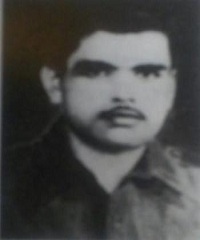 Later Maj Chaudhary got married and had two children, a son and a daughter. During the Indo-China of 1962, his unit 9 Panjab was deployed on the Eastern front in NEFA sector. On 9th October, 1962, Major Chaudhary was ordered to establish a post with two platoons at Sinjang, north of the log bridge in NEFA Sector. On 10th October his post was attacked by a large Chinese force of more than a battalion strength. This attack was sudden and Maj Choudhary and his troops did not have sufficient time to dig in and prepare defenses to fortify their positions. 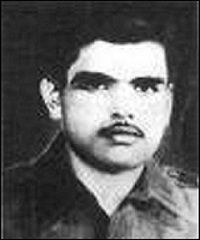 But Major Chaudhary took stock of the situation and motivated his men to repulse the attack in a coordinated manner. His troops had only light arms and did not have sufficient ammunition, yet they managed to keep the enemy at bay for more than 9 hours. On being ordered, he successfully withdrew his men south of the log bridge. Although wounded, Major Chaudhary refused to be evacuated and continued to lead his men in the subsequent operation on the 20th of October. 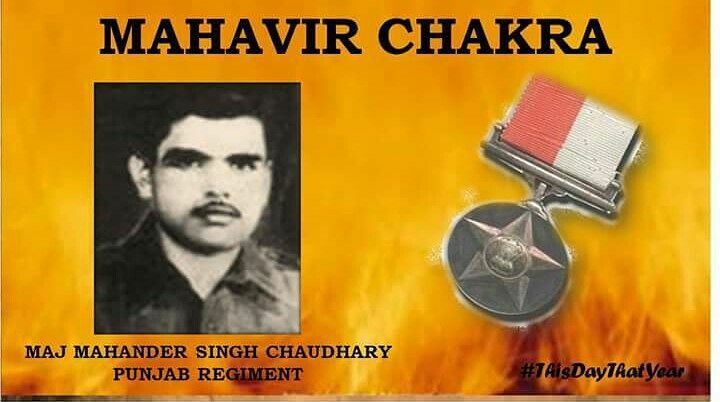 In this action he was able to inflict more than 100 casualties on the enemy and was later martyred on 21 Oct 1962. 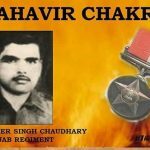 Major Mahander Singh Chaudhary was given the nation’s second highest gallantry award, “Maha Vir Chakra” for his undaunted courage, leadership, indomitable spirit and supreme sacrifice. On 9 October 1962, Major M S Chaudhary was ordered to establish, with two platoons, a post at Singjang, north of the log bridge in NEFA. On 10 October, this post was assaulted by a large Chinese force of about battalion strength. Although Major Chaudhary’s post had not had sufficient time to dig in and coordinate the defences, he stood there with the small arms and ammunition at his disposal and kept the enemy at bay for more than nine hours, after which time he was ordered to withdraw south of the log bridge which he did successfully. Although he was wounded, he refused to be evacuated and continued to be a source of great inspiration to his men throughout this and the subsequent operation of 20 October. In the latter battle, he inflicted some 100 casualties on the enemy. Maj Mahandar Singh displayed courage and leadership of a high order.